Choose us to remove your old timber floors. Timber is a timeless and beautiful floor type, but it is known to deteriorate with age. As its finish wears off, older wood can become more susceptible to being water damaged and may rot and expand with age. Timber floors can also be attacked by termites or get stained and pockmarked with years of repeated use. If this sounds like your floor, or if it’s just time for a change, we have a removal solution for every type of timber floor. 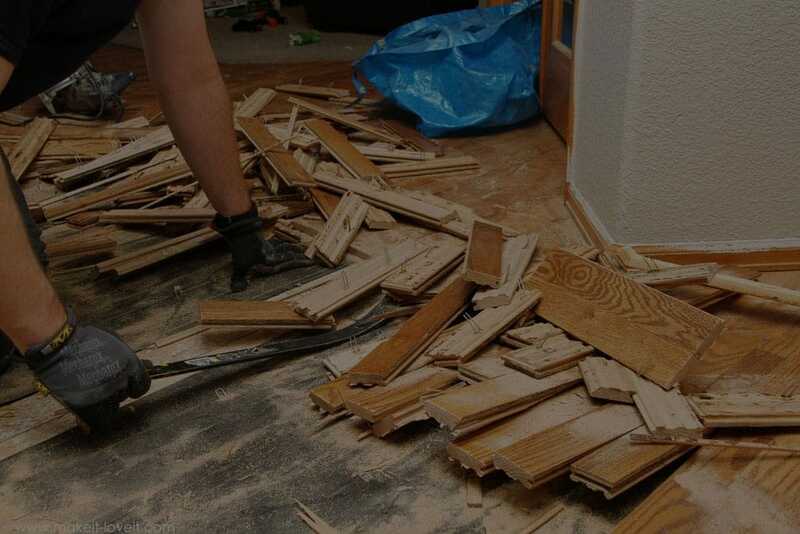 What do I need to know about timber floor removal? Your house will likely have one of the following four types of timber flooring. Here’s how we would deal with each in order of removal difficulty. The wood of floating floors is not affixed to the subfloor beneath, making this type of floor easier than the other types to remove. Once we remove any skirting board, we would remove a starter piece of flooring and then remove each piece. It’s a bit like doing a jigsaw puzzle in reverse! Timber floorboards in older homes will often be nailed onto a lattice of floor supports, also known as “joists”. To remove these floorboards, we would make cuts along some of the floorboards to make a space to hammer up the rest of them. The wood of these floorboards may be valuable, so we would work in a way that minimises damage to them. This type of timber flooring is more difficult to remove. Most plank on plywood floors will have an underlay of cement sheet or plywood that the planks have been glued or nailed to. These are in turn laid on a concrete or timber subfloor. We’ll cut the floor and underlay into smaller, more manageable pieces, and then lift the underlay and floor covering off the subfloor. We would then remove all nails from a timber subfloor, or grind any glue adhesive from a concrete slab subfloor. These types of timber floors are the most labour intensive to remove as they will be glued to a concrete slab subfloor. First we would separate the timber from the concrete and adhesive with a specially modified jackhammer. We would then grind down any excess adhesive with a floor grinder, leaving the concrete smooth and ready for the new floor re-lay. For all of the above, we would also ensure that we take an debris with us and that we vacuum and clean the site before we leave. What domestic timber floor removal services do we offer? Why professional timber floor removal? Some types of timber floors such as floating floors and floorboards are still valuable and you may wish to re-sell or re-lay these floorboards elsewhere. By employing amateurs or “bargain-basement” contractors, you run the risk of damaging these floorboards or worse yet, the subfloor beneath. Don’t waste your hard earned money and precious time on sub-par removalists. Here at Hard Labour, we pride ourselves on being amongst the leading Melbourne timber floor removal specialists. We do our job once and we do it right. When it does come time to remove a timber floor, you can rely on us to have the expertise and experience to get the job done quickly and to the highest standards of workmanship. This is because we value your business and want to leave you with a good impression. That way, the next time you need a floor removed, a wall knocked down, or some backyard concrete demolished, we’ll be the first ones you call. If you would like a fast and accurate quote, get in touch via the contact form on the right and someone will be in touch shortly. Hard Labour was established several years ago with the simple purpose of providing clients with high quality demolition, stripout and floor removal services at value for money prices. Our customer focused approach combined with our professional experience makes us the experts you can trust to complete your next home renovation with a minimum of fuss. Copyright © 2018 Hard Labour Co.